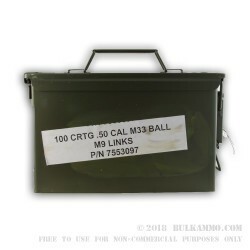 For some it would be hard to hear that this 100 round case of .50 BMG ammunition is actually a bargain with the linked steel clips and the Lake City manufacturing. The 660 grain ball ammunition is mil specification for civilian prices. The quality of manufacture and the price point make this a no-brainer for shooting your .50 BMG, with significant savings over factory loads, with only slightly less accuracy. You could end up paying 1.75 times as much for factory match ammunition, and the distances at which you’re shooting the .50 BMG the 1/2MOA improvement in accuracy based solely on the loading of the ammunition may not even matter. If you want a “plinking” round or a general target round for the venerable .50 BMG, this is the stuff you get. And while it’s not the prettiest, as it has annealing marks and it may be slightly ugly from storage, it is perfectly functioning, very high-end ammunition. The, at least 10% cost savings over competitor cartridges makes this a very easy choice for those already committed to the .50BMG platform. 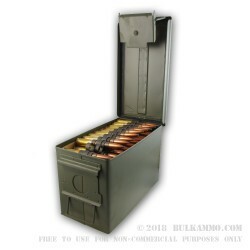 This is a 660 grain full metal jacket with Brass casings and a Boxer primer. It is the same ammunition that recorded a confirmed kill in the War in Afghanistan for a U.S. Army precision shooter in the 91st Cavalry Regiment in January of 2008 at 2,288 yards – so it has legitimate credentials. It might not be at the same elite level of accuracy as the Hornady AMAX .50 BMG but you’re only paying 2/3’s of the cost per shot, and you can easily reach 1.5MOA with this ammunition. Performance meets expectations, good value. Q: Can linked .50 cal ammunition be chambered and fired in a rifle if you guide the link up your magwell and chamber the first round? A: No. You will need to delink the ammunition in order to use it in anything other than a belt-fed machine gun. It is not complicated or difficult. Twist and pull the rounds backwards out of the link. A: This is factory new ammo. Lake City generally does not divulge the specific contents of their ammo.